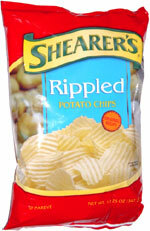 Taste test: These wide-rippled chips were a lot like other soybean oil-cooked chips that we've tried. They actually moisten your mouth when you bite in instead of drying it out like most chips. There was a lots of potato taste at first, but the taste was on the greasy side after that. Smell test: Potatoey and kind of oily, similar to other chips made with soybean oil.